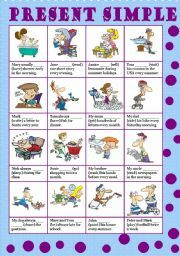 Yls complete the sentences and match them with pictures. Hope u find it useful. thanx for wonderful comments. Have a nice day! This is part one of my ws on posessives. 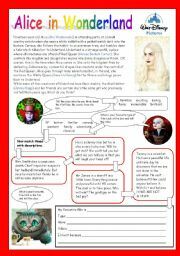 the second page was too large to upload it together with this page so I had to separate them. 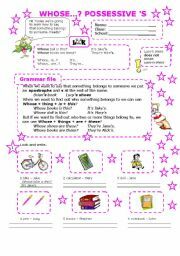 This ws contains some grammar points and one short exercise. the secon one contains exercises only. 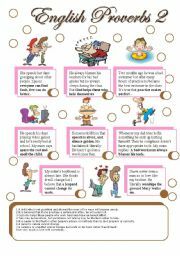 Hope itï¿½s useful. Once again, big hugs for those who leave comments. THAANKS! 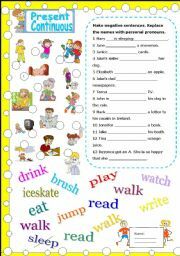 This is worksheet on present simple. Little students make some questions, negative and positive sentences. 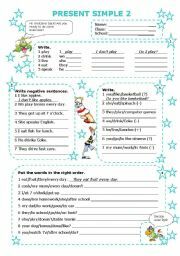 Worksheet with adverbs of frequency follows soon. I hope :) Thanx for your comments. Hope u find it useful! The worksheet contains a review of the film taken and adopted from http://www.moviefone.com. Ss read the text and tell their opinionm about it. Then they tell the class about their favourite movie. They also match the descriptions with types of movies. Hope you find it useful! Have a nice weekend! HUGS! 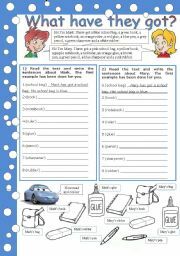 Students read Lucy´s daily routine file and answer the questions. Then, they answer the questions about themselves. Hope it is useful! HUGS!